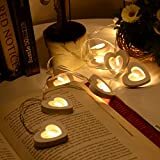 With unique LOVE Heart shape design, warm white LED lights shining through the wooden Heart windows, projecting a subtle glow onto any place you want, great for add festival atmosphere anytime. 10 LED Lighting method: Always on, and 20 LED Lighting method: Always on or Flashes. About 7-15 days free UK delivery. Each light have interval of 10cm, tails cable have 30cm long , total length of 2.2 m.
Great for used around your mirror, child’s dolls house, bedframe or even the edge of a shelve or bookcase, living room, bedroom, bathroom, kitchen, dining Room, office, study etc. Unique warm white LED lights shining through the wooden Heart windows, projecting a subtle and romantic glow onto the surrounding area. These are fun string of lights offering you many choices for where you could place them; try stringing them around your mirror, child’s dolls house, bedframe or even the edge of a shelve or bookcase, Hallway etc.